Learn the skills you need to successfully navigate your ultralight manual wheelchair in a variety of situations and environments so you can more fully participate in the activities you enjoy. In this video, physical therapist Elisa Smith, DPT, of Harborview Medical Center provides practical tips and explanations for learning and perfecting wheelchair skills, including wheelies for curbs and maneuvering in small spaces, on gravel roads, up and down hills, and more. Wheelchair users with spinal cord injuries are shown demonstrating several of these skills. Caution! Consult with your physician and physical therapist before attempting any of these wheelchair skills. Always use a physical therapist or trained spotter to prevent falls while learning wheelchair skills like the ones described here. Presentation time: 31 minutes. After watching, please complete our two-minute survey! A “wheelie” is the act of balancing on your rear wheels in your wheelchair. Wheelies may look like tricks, but “they are the essential building blocks of community wheelchair skills,” said Elisa Smith, physical therapist at Harborview Medical Center. Unfortunately, many people don’t learn this skill before they are discharged home from rehab and then have few opportunities to learn them later on. “Rehab stays now are getting so short that therapists only have time to focus on basic transfers, caregiver training and testing different chairs,” Smith said. “There isn’t much time to practice many ultralight wheelchair skills while still in the hospital.” Once patients get home, there may not be many therapists in their communities who are familiar with wheelchair skills. Several studies have shown that learning wheelies and related skills can improve your quality of life because they help you be more independent and more active in the community, such as going to school, work and social activities. “And if you get invited to a barbecue at a friend’s house, you will be able to go through the grass to get to the back yard,” Smith said. For example, if you are able to pop a wheelie to hop off a curb at an intersection, you can see the traffic and have more control of the chair and be less likely to tip over than if you back down the curb. Physical therapists: see your physical therapist in your clinic or other outpatient setting. Wheelchair Skills Training Program (http://www.wheelchairskillsprogram.ca). by Dalhousie University (Canada). This website features “how-to” videos and detailed descriptions of many wheelchair skills. 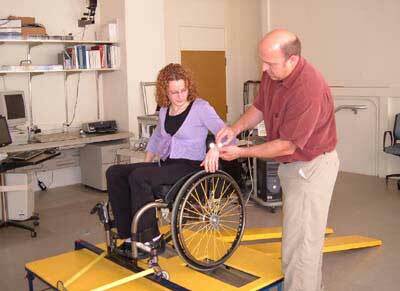 The Manual Wheelchair Training Guide, by P. Axelson, et al. 1st ed. San Francisco, CA: PAX Press; 1998. Visit online forums such as Rutgers University's CareCure Forum (http://sci.rutgers.edu/forum/), where you can join a conversation thread about wheelchair skills and ask questions. 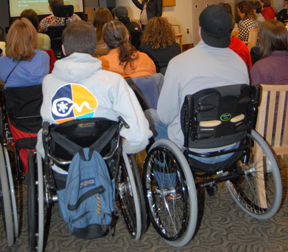 Attend local events like University of Washington's SCI Forums (http://sci.washington.edu/info/forums/) and SCI Support & Information Group (http://sci.washington.edu/info/sig.asp) where you can meet other wheelchair users with SCI. Following is a brief summary of the wheelchair skills and techniques presented at this forum. Watch the video (see above) to get the full descriptions and see demonstrations of these different skills. Caution! Always use a physical therapist or trained spotter to prevent falls while learning new advanced wheelchair skills like the ones described here. A therapist also can train a family member or friend to help spot you while you are learning these skills. Spotting is especially important while you are working on getting your balance in a wheelie. Training progression involves three phases: take off, balance and landing. Landing a wheelie: push the rim forward as you land to soften the impact. Backward: pull back and then push forward on the rims. Forward: push forward on the rims to pop up. This strategy may be slower and require more force, but it enables pop ups during forward propulsion and in tight spaces. Self-recovery: pull back on the rims to tip forward out of a wheelie. A dynamic wheelie is moving or propelling while balancing on your rear wheels. You can go forward, backward, turn, and pivot in place. Practice going forward by setting up a slalom course to propel around obstacles in a wheelie. “Reverse is the most difficult and requires a lot of practice because pulling back to go in reverse tips the chair forward out of a wheelie,” Smith said. Thresholds or flooring transitions: perform a partial pop-up to ascend. Thick carpet: propel in a wheelie. Tight spaces (restrooms, elevators): back into the space and turn in a wheelie. Escalators: “Some places will ask you to not go on an escalator because they’re afraid you’ll get stuck,” Smith said. “You need to ascend and descend facing up. Timing and trunk position are important.” There is a risk of falling or getting stuck, so proceed with caution. Uneven terrain (snow, grass, gravel, sand ): “You pop up into your wheelie and keep the wheels up as you propel forward,” Smith said. “This is a dynamic wheelie and is very labor-intensive because there’s a lot more friction to push against.” Consider knobby tires or larger casters for these activities. Also, some surfaces can damage wheelchair components. Depressions (potholes, grates): Pop into a partial or full wheelie, which lifts your casters out of the depression, and go across on your rear wheels. Freeing wheels from being stuck in a grate or hole: rock side to side. Raised obstacles (roots, railroad tracks, hoses): Pop your casters over the obstacle, flex your trunk, and use push strength or momentum to go over the obstacle with the rear wheels as your casters land beyond the obstacle. Crossing a slope: push faster with one hand than the other. Going up: If you don’t have enough balance or momentum and you can’t stay forward enough to go up hills, get your chair configuration and fit evaluated by a therapist. You might want to consider mechanical assist or power assist options such as hill climbers, Magic Wheels, or Freewheel, or even a power chair. Going down: pop into a wheelie while you’re on a level area, find your balance point, and lean back as you descend, letting the rims slowly slide through your hands. “Descending in a wheelie allows you to control your speed a little better,” Smith said, “and if the hill is really steep, it keeps you from pitching over as you go down.” Plastic rims will burn when descending quickly, so use gloves to increase your power and decrease burning. Avoid using a chest strap: “Even if it gives you some stability on the levels, if you’re always cinched down into the backrest with the chest strap, you can’t lean forward and back enough to keep your balance with many of these skills,” Smith said. Timing of caster pop-up: Low or late pop up may result in casters hitting the curb, abruptly stopping the wheelchair. High or early pop up may result in rear wheels hitting the curb too soon, decreasing momentum. “Practice going up to the curb and popping up without worrying about getting on top of it, so you can get comfortable with the timing of the pop up and with how high you need to get the casters up,” Smith said. Rear wheel ascension: getting the rear wheels up on the curb after your casters are up there depends on wheelchair pitch angle, velocity, trunk position, and hand position. If you do go down backward, flex your trunk to avoid flipping. Descending backward can cause more pain and discomfort than descending forward because the shock goes through the front casters, which can’t absorb it as well as the rear wheels. Wheelchair Skills Training Program. Dalhousie University. Available at: http://www.wheelchairskillsprogram.ca/. Accessed September 18. 2010. Anneken V, Hanssen-Doose A, Hirschfeld S, Scheuer T, Thietje R. Influence of physical exercise on quality of life in individuals with spinal cord injury. Spinal Cord. 2010;48:319-399. Kilkens O, Post M, Dallmeijer A, van Asbeck F, van der Woude L. Relationship between manual wheelchair skill performance and participation of persons with spinal cord injuries 1 year after discharge from inpatient rehabilitation. J Rehabil Res Dev. 2005;42:65-74. Coolen A, Kirby R, Landry J, et al. Wheelchair Skills Training Program for clinicians: a randomized controlled trial with occupational therapy students. Arch Phys Med Rehabil. 2004;85:1160-1170. Best K, Kirby R, Smith C, MacLeod D. Wheelchair Skills Training for community-based manual wheelchair users: a randomized controlled trial. Arch Phys Med Rehabil. 2005;86:2316-2123. MacPhee A, Kirby R, Coolen A, Smith C, MacLeod D, Dupuis D.. Wheelchair Skills Training Program: a randomized clinical trial of wheelchair users undergoing initial rehabilitation. Arch Phys Med Rehabil. 2004;85:41-50. Axelson P, Chesney D, Minkel J, Perr A. The Manual Wheelchair Training Guide. 1st ed. San Francisco, CA: PAX Press; 1998. Kirby R, Smith C, Seaman R, Macleod D, Parker K. The manual wheelchair wheelie: a review of our current understanding of an important motor skill. Disabil Rehabil: Assistive Technology. 2006;1:119-127. Bonaparte J, Kirby R, MacLeod. Learning to perform wheelchair wheelies: comparison of 2 training strategies. Arch Phys Med Rehabil. 2004;85:785-793. Bonaparte J, Kirby R, MacLeod D. Proactive balance strategy while maintaining a stationary wheelie. Arch Phys Med Rehabil. 2001;82:475-479. Kirby R, Gillis D, Boudreau A, et al. Effect of a high-rolling-resistance training method on the success rate and time required to learn the wheelchair wheelie skill. Am J Phys Med Rehabil. 2008;87:204-211. Koshi E, Kirby R, MacLeod D, Kozey J, Thompson K, Parker KE. The effect of rolling resistance on stationary wheelchair wheelies. Am J Phys Med Rehabil. 2006;85:899-907. Kirby R, DiPersio M, MacLoed D. Wheelchair safety: effect of locking or grasping the rear wheels during a rear tip. Arch Phys Med Rehabil. 1996;77:1266-1270. Kirby R, Bennett S, Smith C, Parker K, Thompson K. Wheelchair curb climbing: randomized controlled comparison of highly structured and conventional training methods. Arch Phys Med Rehabil. 2008;89:2342-2348. Kwarciak A, Cooper RA, Fitzgerald SG. Curb descent testing of suspension manual wheelchairs. J Rehabil Res Dev. 2008;45:73-84. Newton AM, Kirby RL, Macphee AH, Dupuis DJ, Macleod DA. Evaluation of manual wheelchair skills: is objective testing necessary or would subjective estimates suffice? Arch Phys Med Rehabil. 2002;83:1295-1299. Kilkens O, Dallmeijer A, de Witte L, van der Woude L, Post M. The Wheelchair Circuit: construct validity and responsiveness of a test to assess manual wheelchair mobility in persons with spinal cord injury. Arch Phys Med Rehabil. 2004;85:424-431. Groot S, Bevers G, Dallmeijer A, Post M, van Kuppevelt H, van der Woude L. Development and validation of prognostic models designed to predict wheelchair skills at discharge from spinal cord injury rehabilitation. Clin Rehabil. 2010;24:168-180. Stanley R, Stafford D, Rasch E, Rodgers M. Development of a functional assessment measure for manual wheelchair users. J Rehabil Res Dev. 2003;40:301-308. 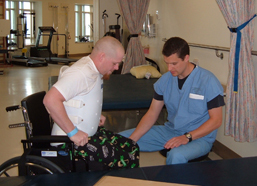 Kilkens O, Dallmeijer A, Angenot E, Twisk J, Post M, van der Woude L. Subject- and injury-related factors influencing the course of manual wheelchair skill performance during initial inpatient rehabilitation of person with spinal cord injury. Arch Phys Med Rehabil. 2005;86:2119-2125. Kilkens O, Dallmeijer A, Nene A, Post M, van der Woude L. The longitudinal relation between physical capacity and wheelchair skill performance during inpatient rehabilitation of people with spinal cord injury. Arch Phys Med Rehabil. 2005;86:1575-1581. Best K, Kirby R, Smith, Macleod D. Comparison between performance with a pushrim-activated power-assisted wheelchair and a manual wheelchair on the Wheelchair Skills Test. Disabil Rehabil. 2006;28:213-220. Lighthall-Haubert L, Requejo P, Mulroy S, Newsam C, Bontrager E, Gronley J, Perry J. Comparison of shoulder muscle electromyographic activity during standard manual wheelchair and push-rim activated power assisted wheelchair propulsion in person with complete tetraplegia. Arch Phys Med Rehabil. 2009;90:1904-1915. Algood S, Cooper R, Fitzgerald S, Copper R, Boninger M. Effect of a pushrim-activated power-assist wheelchair on the functional capabilities of person with tetraplegia. Arch Phys Med Rehabil. 2005;380-386.